Samsung's SmartThings is one of the most popular smart home product lines. The company has developed outlets, light bulbs, sensors, and more all designed to work seamlessly together. Tying everything together is the SmartThings Hub, which acts as the bridge between your smart devices and your home's internet connection. 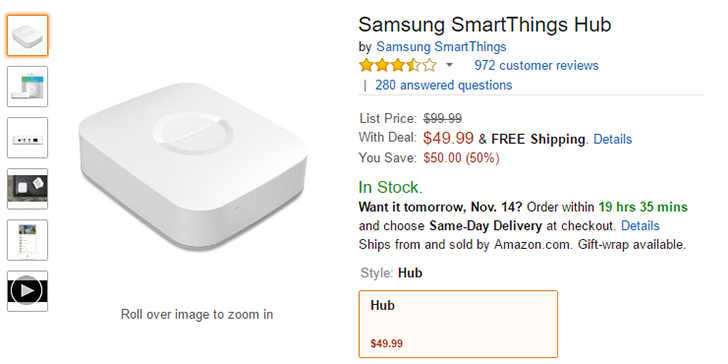 Now you can get the second-generation SmartThings Hub (the latest model) for $50 on Amazon, half off the original $100 price tag. The SmartThings Hub not only works with Samsung-developed smart home products; it is also compatible with dozens of other devices. Phillips Hue, Leviton switches and outlets, Arlo cameras, Honeywell/Ecobee thermostats, and more can all be controlled from the SmartThings Hub (and thus, the SmartThings app). If you happen to have a Google Home or Amazon Echo, you can control SmartThings with voice commands. In addition to the single Hub, the Home Monitoring Kit is down to $150 on Amazon ($100 off). The kit includes the Hub, two multipurpose sensors, a motion sensor, and a smart outlet. There's also a Hub and Leviton dimmer bundle for $99 (normally $120) and a Hub and outlet bundle for $105 (normally $110).